How Do I Video Interview... Interns? Every candidate comes with their own unique set of interviewing challenges. That’s why we’re tackling video interview tips for different types of candidates with this how-to series. Today, we’ll be talking about how to use your video interview to connect with candidates looking to land an internship at your company. How can you tell which candidates will be the interns you wish were full-time employees and which candidates will have you counting down the semester? More and more young workers are looking to get some relevant work experience under their belts before entering the competitive job market. To help them achieve this goal, there are about 1.5 million internships taking place in the U.S. every year. Chances are, your company contributes to this statistic. It shouldn’t be surprising that college — and even high school — students have careers on the brain. The unemployment rate for 20- to 24-year-olds is a staggering 12.7 percent as of August 2012. This means college students preparing for graduation realize industry-related internships are more important than ever to demonstrate value to employers. For students and workers of all varieties, internships can be a great way to gain relevant experience and start developing industry contacts. For companies, interns can help streamline the workload of busy employees. More practically, interns can also work as a talent pipeline for your company. You’ve trained these talented candidates, and when positions open matching their qualifications, you can easily hire them without a lengthy search. Best of all, you already know their personality meshes well with the corporate culture. You want an intern who can truly learn and grow from the experience of working at your company. In other words, you want an intern who is legitimately interested in the industry. Just like asking an entry-level candidate about their five-year plan, ask your intern candidate in the video interview to tell you how the internship fits into their overall career aspirations. Is this an internship that will help this person achieve their goals, or is it just padding for their resume? The best interns will be the ones who want to get real value out of their experience at your organization. You want to make sure the intern candidate has the skills and education necessary to jump in and add value to your organization. It might be a learning experience for your intern, but you shouldn’t have to spend all your time teaching. Make sure to use the video interview to ascertain how much the candidate has truly learned through their educational endeavors. You don’t have former work experience to fall back on, so ask about their classes and the projects they’ve completed. You want an intern candidate with the potential to grow and become a more permanent fixture in your company. If you play your cards right, you can use the internship to test out potential future employees and see if they’re a good fit. The best interns will be the ones with the ability to grow in the workplace and take on new responsibilities. They’ll be the superstars looking to learn new tasks and asking to help with projects you haven’t even assigned. In the video interview, ask about what they want to get out of their internship experience. What do they want to learn? What project or task do they 100 percent want to try their hand at? The more eager and interested the candidate, the better the intern. Look for someone interested in growth opportunities, and you’ll find an intern with the potential to grow as a part of your company. Making sure to hire the best intern candidates can be tricky. But as long as you focus on their passion, education, and potential in the video interview, you’ll find someone you won’t want to let go of when the internship ends. 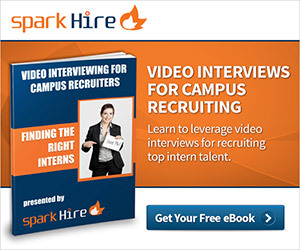 What are some things you look for when talking to intern candidates in the video interview? Share in the comments! How Do I Video Interview…Recent Graduates?